The Center for Sustainable Landscapes at the Phipps Conservatory and Botanical Gardens just opened in Pittsburgh, Pennsylvania, and it hopes to be one of the greenest facilities in the world. The center aims to be the first building to achieve a hat-trick for sustainable certification and is in the running for Living Building Challenge, LEED Platinum, and Sustainable Sites Initiative certification. With its roots in education and research, this exceptional conservatory provides a public education not only on botany, but on sustainability. Designed by Pittsburgh-based The Design Alliance Architects (TDA Architects), this new 24,350 square foot building is the Center for Sustainable Landscapes and will provide educational space to expand and enhance the Conservatory’s programs that are geared towards primary and secondary school students. 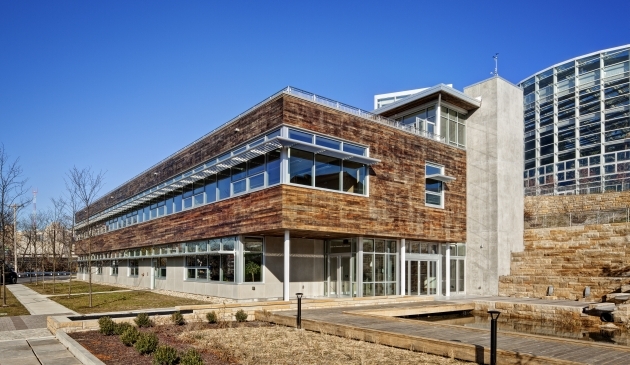 TDA Architects provided master planning and design services for this facility, and was tasked with meeting both LEED Platinum and Living Building Challenge standards. Many sustainable features helped to make this sustainable gem possible. First of all, the structure produces all its own renewable power, which includes geothermal, wind, and solar energies. Passive cooling, heating, and lighting techniques were utilized as many places as possible, and helped to keep energy costs low in order to achieve net-zero energy. Also, since the facility is a botanical wonderland, it is designed with a wetland, lagoon, green roof, rain garden, a water distillation system, and a rainwater collection system for irrigating the many habitats of flora found on the site. Since the facility is a botanical wonderland, the facility was also designed with a wetland, lagoon, green roof, rain garden, a water distillation system, and a rainwater collection system for irrigating the many habitats of flora found on the site. Passive cooling, heating, and lighting techniques were utilized as many places as possible, and helped to keep energy costs low in order to achieve net-zero energy. First of all, the structure produces all its own renewable power, which includes geothermal, wind, and solar energies. This new facility will provide educational space to expand and enhance the Conservatory’s programs that are geared towards primary and secondary school students. TDA Architects provided master planning and design services for this facility, and was tasked with meeting both LEED Platinum and Living Building Challenge standards. 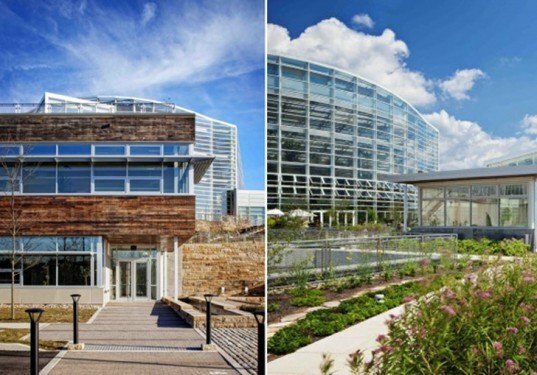 Designed by the Pittsburgh-based The Design Alliance Architects (TDA Architects), this new 24,350 square foot building is the Center for Sustainable Landscapes.